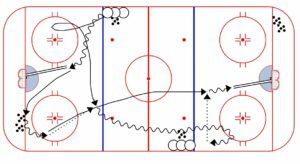 Passing and timing are extremely important concepts for hockey players to understand. This is a drill you can use to introduce these ideas at a young age. As is the case with many drills, you can progress this through from simple to more complex versions as your players progress. 1. First player in line walks in and shoots, then picks up a puck from the corner. 2. Second player in line times it, then explodes as first player is ready to make the pass. 4. First player times it to cross the blue line as the second player is coming out of his misdirection. 5. First player picks up the pass and shoots. NOTE: Run from both sides of the ice at the same time.